New technologies offer trade unionists opportunities to reach out to workers in new ways. In the past, we have often complained that the mainstream media often seems anti-union, and that the only time you read about unions in the papers is when there’s a strike. The media seems to ignore all the other important work that unions do behind the scenes, such as ensure we are paid properly, that our workplaces are safe – and that we have the chance to improve our skills by learning the things that interest us. New technologies provide us with a way around this by letting us talk directly to each other – and they keep getting better. This article will look at some of the opportunities offered by new technologies. Unions have been using the Internet to get their message across, and organise, for a long time. Most trade unions have a website, including my own union, Unite. In addition to this, both the TUC and the STUC have websites providing useful information for trade unionists. The TUC also hosts the excellent Union Reps online forum, as well as unionlearn, which is a good resource for trade union lifelong learning material. Unions also use the Internet for international campaigning and organising. In addition to well-known and established sites like the ILO and the International TUC, the most well known and successful campaigning site is LabourStart. LabourStart has been very successful in using the Internet to create international campaigns around union issues, and has been able to influence a number of disputes by getting trade unionists around the world to flood offending companies with letters of complaint. The style of union websites varies, and LabourStart has been holding a labour website of the year competition since 1997 – you can vote for your favourite trade union website. The editor, Eric Lee, has a blog about unions using technology. In this article, he argues that unions should use free open source software, like Ubuntu Linux, instead of Microsoft. Let’s have a look at the state of the Internet today, and what it has to offer. OK, so by now you’re familiar with email and the Internet. But have you ever heard of web 2.0? It stands for the Internet, version 2, and it refers to the explosion of new facilities available on the Internet, such as blogs, feed readers, social networking sites and more. This article will take you through some of the crucial elements of web 2.0, show you what you can get out of it, and how it can be used for union organising. Firstly, don’t be put off by the terminology. Web 2.0 is easy to use, more so than the ‘old’ Internet, and if you’re reading this, then you’re already part of the web 2.0 world: welcome! People are always a little nervous about doing something new, and there are plenty of scare stories out there about things going wrong on the web. But it’s not as scary as you think: you’re not going to accidentally hack into the Pentagon by pushing the wrong button. The fear that most people raise is of identity theft, and this is a real issue. Every time we type information onto a website, it gets stored somewhere, so always be careful of giving away too much about yourself: there is no such thing as online privacy. Never respond to emails claiming to be from banks that ask you to log on to a site and enter your password. There is more about this issue in the section on social networking below. You also need to be aware of corporate IT policy if you are using a computer at work. Make sure you know what sites you are allowed to visit at work, and what you are allowed to access as part of your union duties. Before you set off on your journey along the information super highway, you need a vehicle: an Internet browser. Most people use Internet Explorer (IE) because it comes free with their computers. IE is like the Vauxhall Vectra of the information super highway and it might be right for you. But there are also zippy little sports cars like Google Chrome and Opera, and browsers that make it easy to share websites and pictures with family and friends, like Flock. All things considered, probably the best browser to use is Firefox, because it is the most adaptable, and can be personalised. It was the first website to support tabbed browsing, making it easier to move from one to the other, and it can block ads and annoying pop-ups. Have a look at the links above and see which browser appeals to you – they are all free to download and use. As you venture out into the wide world of web 2.0, you will need a home base, a safe haven to set off from. A good starting point would be to create a free account at Google. This will give you a home page, a free email account – and Google mail is one of the best – a feed reader, blogging software, a place to store you photographs and much, much more – including documents, spreadsheets, presentations, and soon wikis too. What are you waiting for? Open an account now. Once you’ve done so, you can customise your home page, and import all your favourite news stories – more about that later. There are so many useful websites on the Internet – how do you remember where they all are, and find them again? One way is to save them to your Favourites, or bookmark them, in your browser. But that means that you’ll only be able to find them if you use the same computer every time, so it’s really only useful for sites you visit every day. You need an online bookmarking service like delicious. delicious allows you to save your favourites online, so you can access them on any computer, and share them with your friends. This is the delicious logo. When you see this on a page, you can save the page to delicious just by clicking it. delicious also uses tags to make it easier to find things you have saved. A tag is a label you can put on an article, for instance ‘holiday ideas’, ‘work stuff’ or ‘Unite’. Then you can search by tag to find things more quickly. If you are researching a certain subject, or tracking a news story, you can use feed to subscribe to the tags. More information: here is a comprehensive article on using delicious. Then there are social bookmarking sites, where you can post articles that interest you. Other people can vote them up or down, and the most popular articles make it to the front page. There’s always something interesting to read on the front pages of reddit and digg! More information: Here’s a BBC guide to social bookmarking. Here’s a Wikipedia article on social bookmarking. Blogs are like online diaries, where the most recent entry is displayed first. The word blog is short for web log, and they are a great resource for trade unionists. Anyone can start a blog, as it is free and the skills can be very quickly learned – it’s about as easy as writing an email. Even if you only write a few lines, it’s a useful way of tracking what’s happening in your workplace. There are loads of trade unionists out there blogging about their own experience. Some blogs are written by ordinary workers, others by activists, branches or trades councils – some have as many as ten authors. Union blogs allow branches and workplaces to keep members informed. Union blogs also facilitate informal links between workers in different countries, such as these blogs by British and South African workers at Vodafone, who are supporting each other in their struggles for recognition. These are some of my favourite blogs: The Socialist Unity Blog has a group of authors from a variety of backgrounds. Most are trade unionists, and they write political and cultural analysis from a union and socialist perspective. Union Futures is the personal blog of a Unison activist, and discusses issues facing trade unionists, while for those interested in economics, Labour and Capital provides some very dense analysis of financial markets from a union point of view. John, innit? is always good for some union news and analysis. If you want to find blogs to read, a good place to start is a blog aggregator, which brings together the content from lots of blogs into one place, making it easy to find. The biggest is Technorati, which has 70 million registered blogs that you can search by theme. You can create an account and read all your favourite blogs in one place. If 70 million is a bit much for you, try the UK union blog aggregator, tigmoo – it stands for This Great Movement Of Ours. Tigmoo pulls together content from a lot of British union blogs. If you are keen on starting your own blog, we recommend WordPress or Blogger. And if you’re not much one for writing, you can try video blogging with your mobile phone. For those not keen on writing, it’s becoming easier and easier to use video. You can record a video on your mobile phone or camera, and post it on YouTube, a site that allows you to host videos for free. If you like, you can host it on your blog as well. A podcast is simply a video or audio programme that you can watch or listen to on your computer, through a program like iTunes, Media Player or Amarok. You can set your media player or smart phone to subscribe to a podcast, so that it is downloaded automatically. If you have an iPod or smart phone, you can also download it and watch or listen to it on the train to work. The BBC and many other news websites have podcasts of their most popular programmes that you can watch in your own time. Why not subscribe to the Labourstart podcast? Wikis are websites that anyone can log into and edit, so that the final page is the result of the efforts of lots of people. The Amicus Learning and Skills website has a number of wikis, which any participant can be involved in creating. The most famous wiki is Wikipedia, which is an online encyclopaedia created by tens of thousands of ordinary people around the world. There are hundreds of thousands of articles on the site, covering everything from A to Zinedine Zidane, and everyone of them was written by unpaid volunteers. If you like, you can log in and write your own article, or edit an existing one. We live in the information age. There is information streaming towards us all the time, and thousands of useful websites out there. It can all be very confusing and overwhelming. Now, how do you keep track of all these different blogs and news sources on the Internet? It’s a lot of websites to remember! One easy way is through RSS, which stands for Really Simple Syndication. RSS provides ‘feed’ from a website that you can subscribe to. This allows you to have all your favourite content on one page. If you imagine the Internet as a sea of information, then using RSS is like putting a net into the sea – except that you can choose exactly what you catch. This is an RSS feed icon. When you see this on a web page, it means you can subscribe to the page by clicking the icon. It’s like being the editor of your own newspaper or magazine: you can choose the news and sports articles you’re most interested in, along with the jokes, puzzles and pictures, and access them all on one page. You can have The Guardian editorial along with the Daily Record’s sports coverage, BBC weather and pictures from your friends’ holiday. To use RSS, you need a ‘feed reader’. Good Internet browsers like Firefox include built in feed readers, although we’d recommend using Google reader. If you open a free Google account, you’ll get the reader with it, and it will integrate nicely with everything else you’ve got on Google. Excercise: go to the BBC News website and see if you can subscribe to the news feed. More information: here’s a BBC guide to using feed. You can find more than you could possibly need to know about RSS here. Cartoon by Dave Walker. Find more cartoons you can freely re-use on your blog at We Blog Cartoons. Another important part of the new Internet is social networking sites, like Facebook. Once you’ve registered for one of these sites and created a profile, you can find your friends online and share photos, music and more with them. There’s a Unite group on Facebook, which the union uses to organise and coordinate activity, and there are also thousands of political and campaigning groups. Be careful: If you decide to use Facebook, or another networking site, remember to look at the privacy settings. If you let everyone see your profile, you can potentially give away a lot of information about yourself that could be used by some one wanting to defraud or embarras you. If you’re worried about your privacy on Facebook, and want to try trade union social networking, why not check out Unionbook? There’s plenty of scope for fun on web 2.0 too: if you like music, for example, create an account at last.fm, an Internet radio station that learns what you like and recommends songs to you. Create a profile, and type in the name of a band you like. The software will play similar music for you, and you can ‘love’ or ‘ban’ the songs until it knows your taste better than you do. Also, have a look at Uncyclopedia, a spoof on Wikipedia. It contains nonsense encyclopedia entries, some of which are very funny. There are also some very strange corners of web 2.0, like online role playing games. Some users spend days at a time in cyber space – sometimes with fatal results, like the girl who died playing the online game World of Warcraft (WoW): she didn’t eat, drink or sleep for days. WoW now has a staggering 8 million players. Another bizarre example is Second Life, which is exactly what it sounds like: an alternative, web-based reality where you can buy property, set up business or even get involved in politics. Recently, there was a confrontation in Second Life between Second Life Left Unity and a fascist organisation that was trying to set up shop there. You can read about it a Guardian article with one of the weirdest headlines ever:Exploding pigs and volleys of gunfire as Le Pen opens HQ in virtual world. 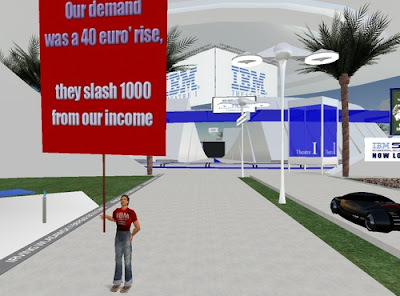 Even more bizzarely, the global union for IBM employees organised a protest against the company in Second Life – workers from 18 countries took part. Both the union and IBM have headquaters in Second Life. It makes a change from the usual picket, doesn’t it? 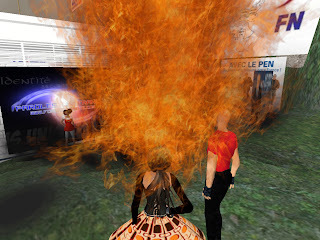 Second Life or other protest locations. You will meet our staff who will greet you at each location. Platform and try another location. You can read an article about the protest here. Maybe these people should pay more attention to their first lives! The future: where’s it all going? So where’s it all going? Experts aren’t sure, but some people are already speaking about web 3.0, or the semantic web. It’s complicated, but what it seems to amount to is different applications communicating with each other: the web gurus talk about ‘data swarms’ following you through cyber space. Imagine it like this: you film a video on your mobile, and text it to an online service like YouTube using MMS. From YouTube, feed readers will automatically send it to your Facebook profile, your blog, and onto the computer or phone of anyone who subscribes to your feed. Within seconds, anyone in the world will be able to see your video, and as this technology gets cheaper and easier to use, it opens new possibilities for people to communicate with each other. But that’s all for the future. Hopefully by now you have a better picture of what web 2.0 is, some of the programs and websites that make it up, and what can be done with this technology – the limit is your imagination: enjoy!